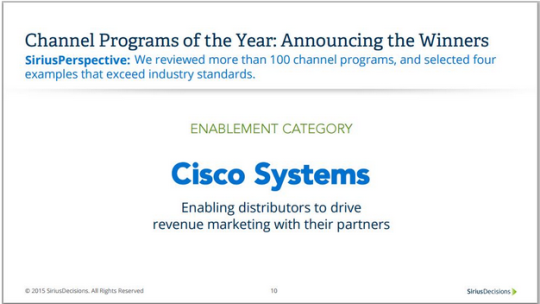 Cisco has seen leads jump by 431%! 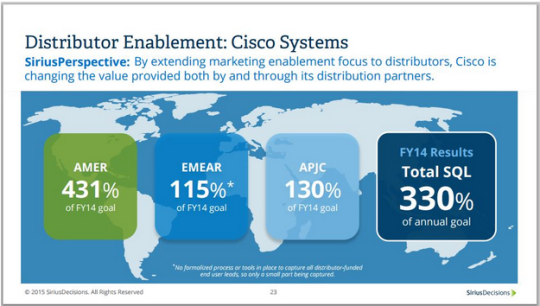 May 19, 2015 (New York, NY) – The marketing team responsible for distributor covered Cisco partners, Cisco – Distribution Marketing, sought to change the value proposition its distributors offer to Cisco partners. 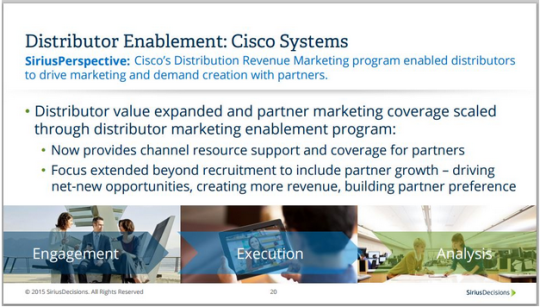 Looking to move beyond physical distribution and partner recruiting, Cisco crafted a program to enable distributors to drive demand through their partners which could multiply Cisco’s brand presence across many more resellers. Existing Challenges: Of course, this objective brought with it many obstacles, some existing and some new. Distributors are often very protective of the relationships they have with their partners, and they may represent several different brands with the same partners. 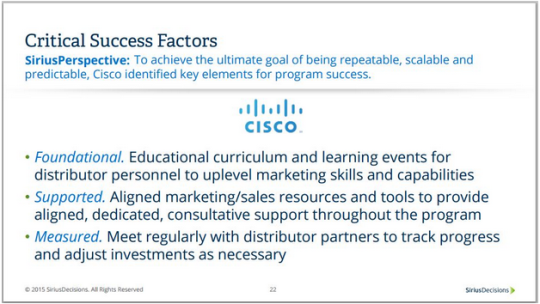 Also being able to offer Cisco marketing programs to distributors that allow for flexible customization (for both the distributor and the partner) can be a major logistical challenge. StructuredWeb’s scalable, automated marketing automation platform was built specifically to overcome these obstacles for large, global enterprise companies. How: A key aspect of this program’s success was the StructuredWeb platform’s ability to replicate campaigns on behalf of many resellers at once. These campaigns can either be pushed to the reseller account where they can execute on their own, or the campaigns can be customized and executed on behalf of the reseller – a true value add for partners who typically don’t have a lot of time or marketing resources. This provided a clear advantage to the Cisco distributors who could now offer enhanced marketing support in a scalable, cost efficient manner. 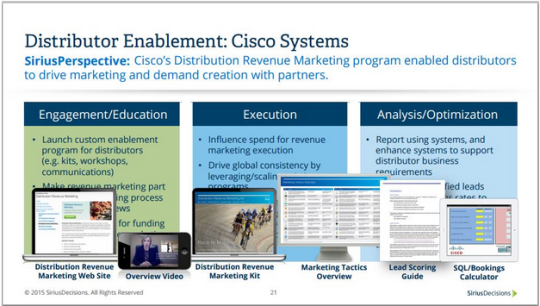 Since all of these campaigns and marketing activities were launched from the same platform by the distributors, the partner account managers at the distributor also had access to significantly more marketing data and lead generation data for the Cisco sponsored programs. Successes: Leads, leads, and more leads! Although MQL’s and SQL’s are hardly the only determining factors for a successful channel marketing program, this distributor-enabled model showed that global distributors not only are providing support to their partners but can also measurably and scalably increase lead generation. Using Cisco’s existing SQL goals as the benchmark, this program achieved 431% of its SQL goal for the Americas and over 330% globally! Launching a program that generates leads is only part of the battle because Cisco also wanted to make sure that any success was repeatable and therefore scalable across its massive global organization of distributors and resellers. It will be exciting to watch this program grow across more distributors, and I am sure other OEM’s and vendors alike will be modeling this extremely successful model of distributors supporting their resellers with marketing campaigns that effectively drive leads and qualified opportunities. Distributors adding value to partners by exceeding annual SQL goal by more than 3x!